My 4yo son is prone to frequent bloody noses, often in the middle of the night. When this happens, my husband and I are aroused from our peaceful slumber by a small knock at our bedroom door and a distressed cry. "I have a bloody nose!" One or both of us will get up and help our poor son so we can all get back to sleep. Sometimes, all that is needed is a tissue and a little patience. Other times, a full-on shower and change of bedding is in order. But no matter what, we're there for him until the bleeding stops. Every so often, our son doesn't knock. He screams and cries and pushes us away. He thrashes about as we attempt to hold a tissue to his nose, causing the blood to flow faster and longer, turning a mild issue into a grueling ordeal and leaving behind a bloody mess. 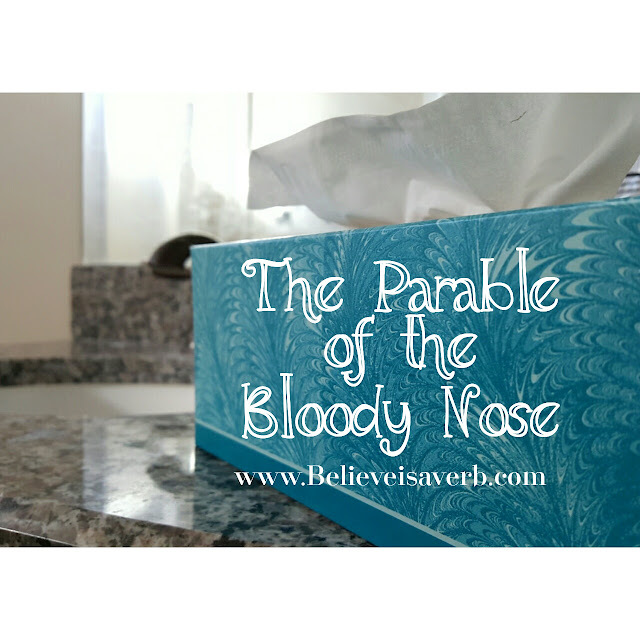 As children of our Heavenly Father, we often have unexpected troubles arise - not unlike my son's bloody noses. As we struggle, we cry out to our Father in Heaven, begging for His help to stem the flow of trials. Sometimes our problems are easily solved with prayer and a little patience and we're able to return to the relative peace of our lives. Other times, our trials are more difficult and involve greater effort, more "clean up" to make things right. No matter what, our Father is there, helping us until our trials subside. Every so often, we try to brave our storms alone. We fight our Heavenly Father and push away His efforts, insistent on bemoaning our fate instead of allowing our God in Heaven - all-knowing and all-powerful - to help. Our trials seem to increase and multiply and what could have been a simple fix turns into a drawn-out ordeal, leaving behind a chaotic mess. Just as my husband and I know whats best for our son, our Heavenly Father knows what's best for us. In His infinite wisdom, He knows how to help us if only we would allow Him to help. All we have to do is go to Him in humble prayer and say, "Father, I have a problem! Please, help me." Because of the great love He has for us, Heavenly Father will come to our aid. Perhaps not in the way we think or hope he will, but He will come. All we must do is believe.